Have you ever dreamed of visiting a place so badly that you looked for any possibility to make your dream come true? 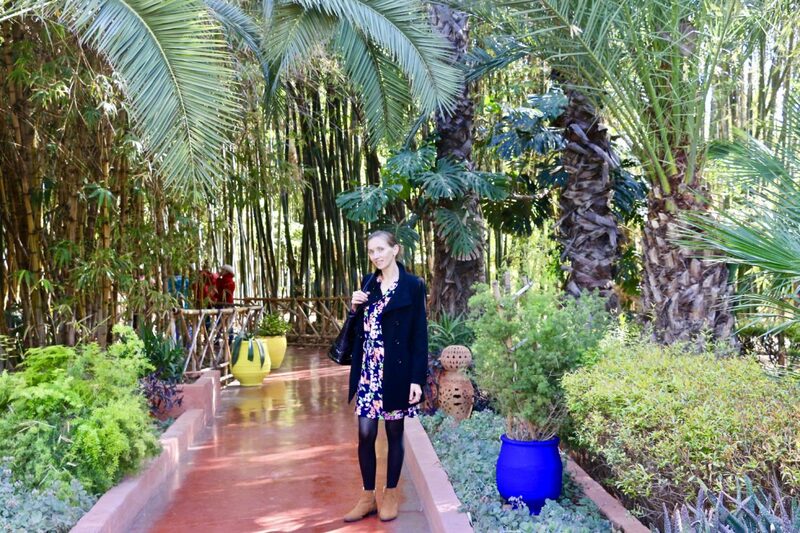 Marrakech was that dream destination for me. 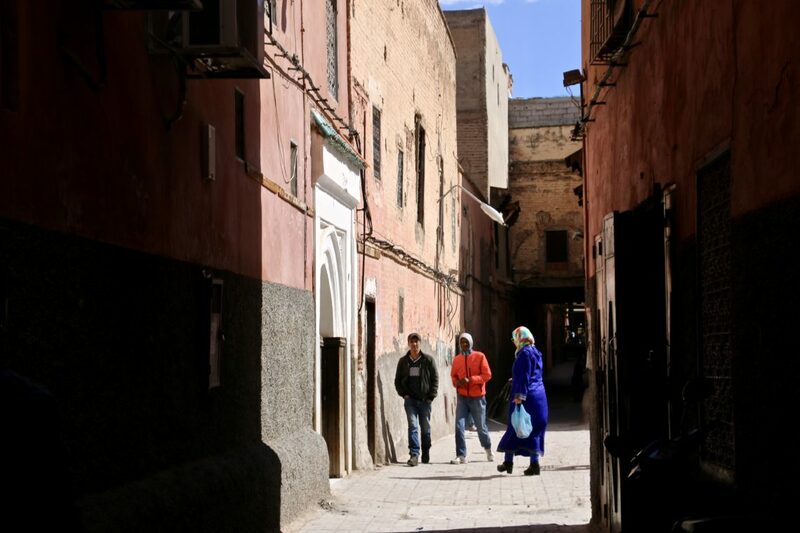 I wanted to explore and walk down the streets of this North African city for years, but paying on average from $1100 to $1500 for an off-season round ticket from Los Angles to Marrakech did not seem reasonable. However, as an old saying says, “Look and will find it”, the solution knocked on the door unexpectedly. Booking our flight to Europe, I was struck with a brilliant idea to check the flights to Morocco from Europe. 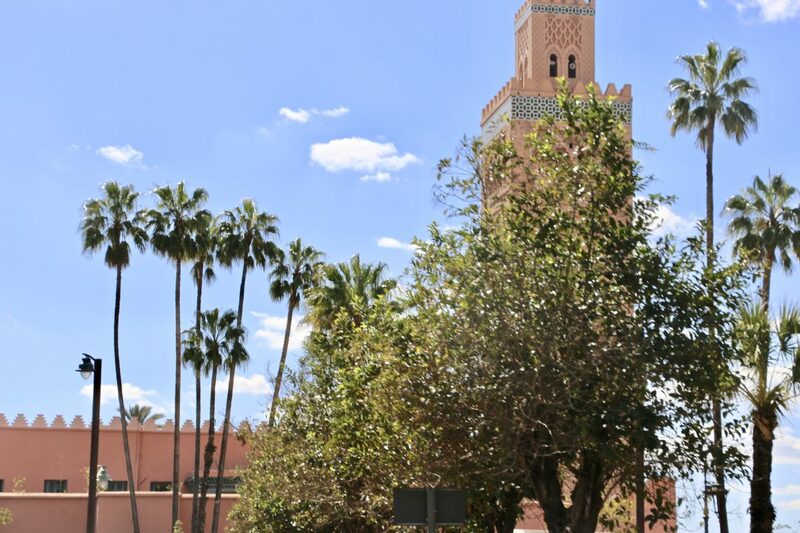 An airplane ticket from Los Angeles to Europe together with an additional ticket from Europe to Morocco turned out to be cheaper than one direct flight from LA to Marrakech. How could you say “no” to this? Fast-forward a few months, on one sunny yet quite chilly Wednesday morning our plane safely landed in Marrakech, one of four Imperial cities of Morocco. 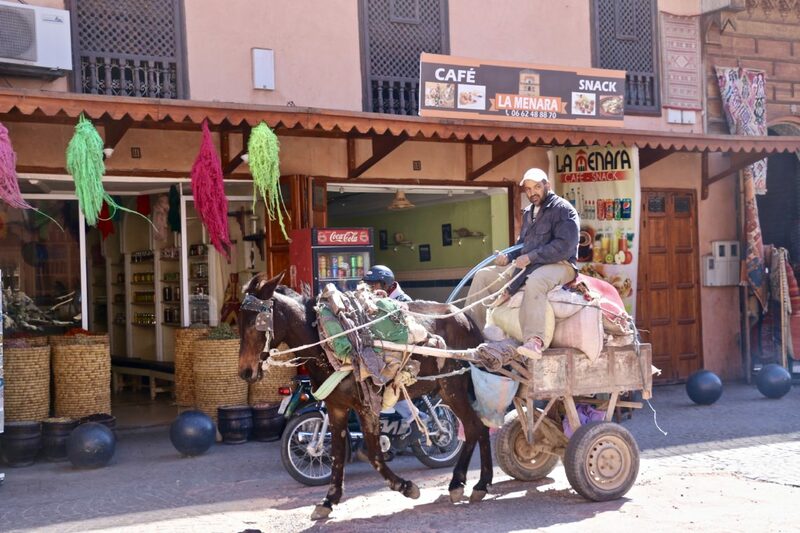 Located in shadow of Atlas Mountains, every year Marrakesh attracts millions of visitors from all corners of the world. 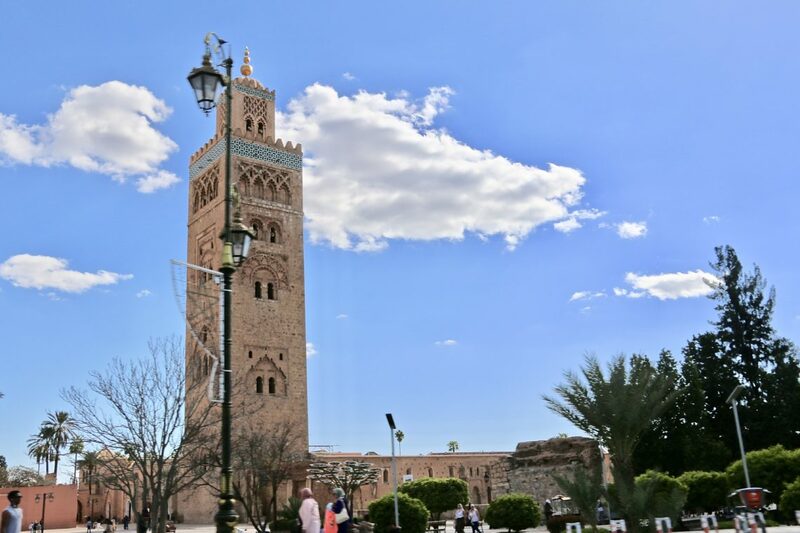 Not surprisingly, in 2015 this Moroccan national treasure, commonly known as the Pearl of the South or the Red City, was named the Best Destination in the World. Everything from a perfect mixture of new and old, rich cultural traditions and gleams of modern customs entice, bewitch and beckon you to visit this red city, explore its ancient mosques and palaces, experience its every corner, get lost in the maze of its ample alleys while shopping for an authentic Moroccan rug or traditional tea set. On a shopping related note, let me give you one valuable advice. 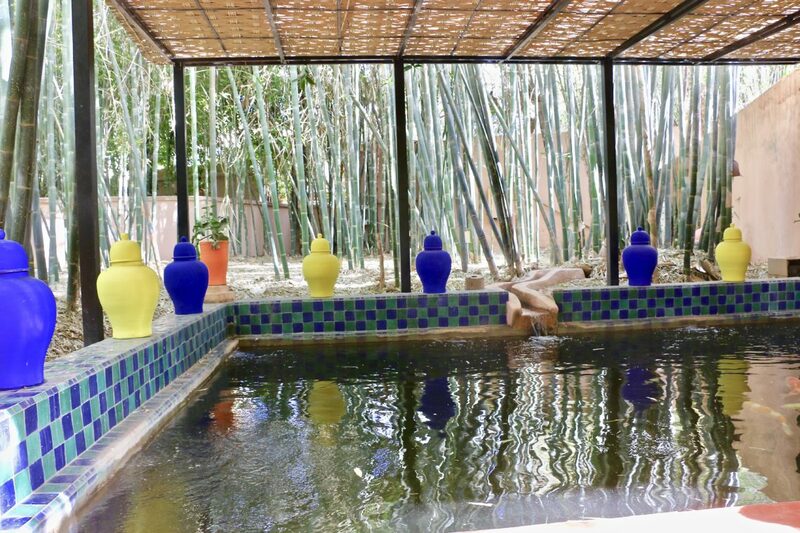 Come to Marrakech with half empty (better completely empty) luggage so you can fill it up with genuine Moroccan jewelry and home décor items that you will not be able to avoid buying. Are you ready for an adventure? 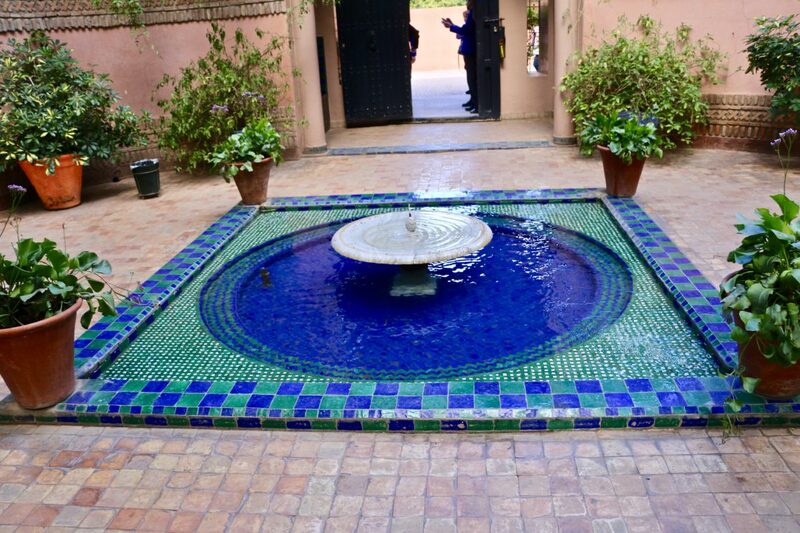 Let me guide you around Marrakech and introduce its 5 true marvels. 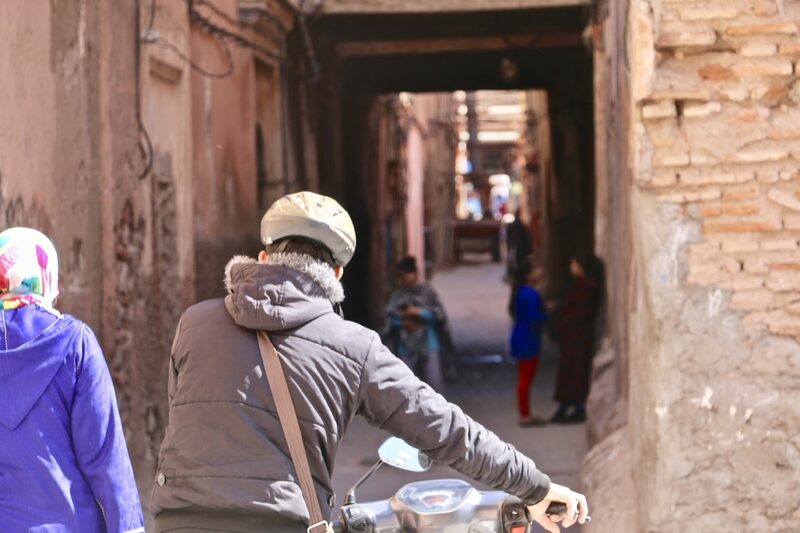 Surrounded by red ramparts, medina of Marrakech is the oldest part of the city taking its well-deserved place right in the heart of Marrakech. 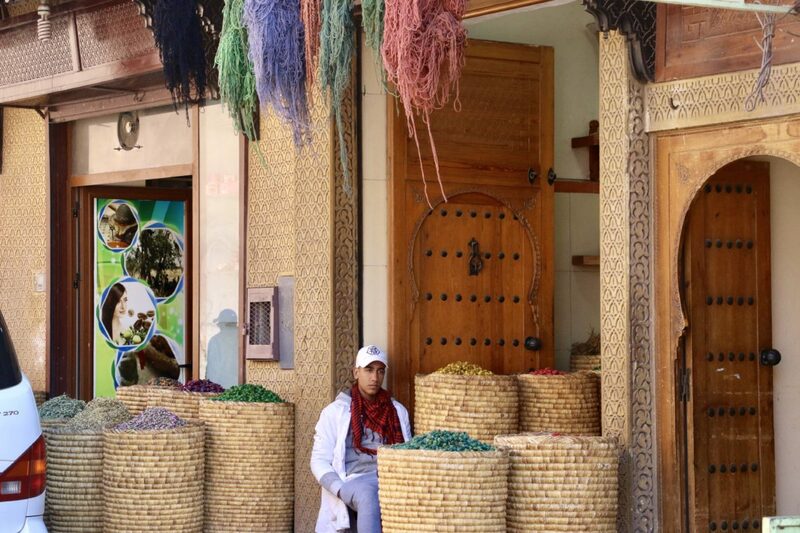 Once a political, economic and cultural center of the western Muslim world, the medina was inscribed on the UNESCO World Heritage List almost four decades ago. As soon as you approach massive gate leading to the old city, you get a strange sensation that the time freezes within the walls, and the town uninterruptedly continues its life without any influences from the “outside” world. Narrow, maze-like streets and alleys, artisanal activities, busy souks, ancient looking houses, lavish fondouks and riads give a real life history lesson and a chance to transition from a mere observer to an contributing participant and creator of the modern, yet what feels like, lost in time history of the city. 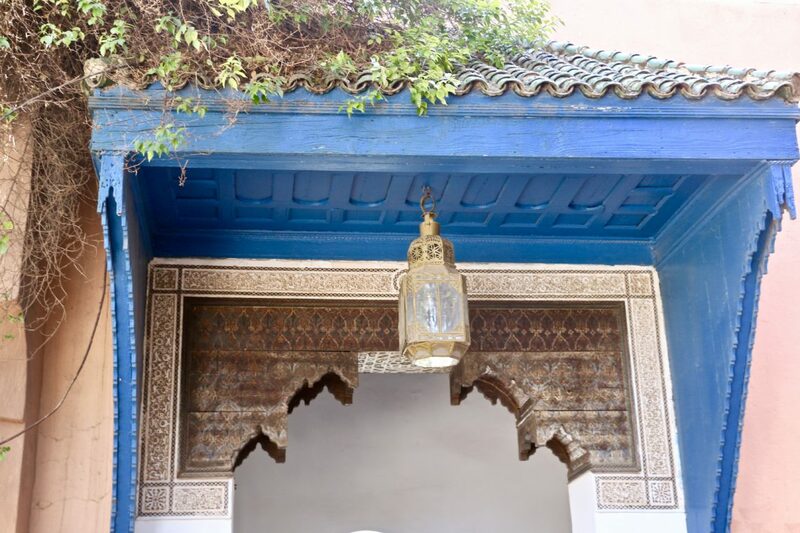 If not for many tourists wandering around the medina, you would be convinced that some mystical forces transferred you back in time to the ancient 11th-century African city. 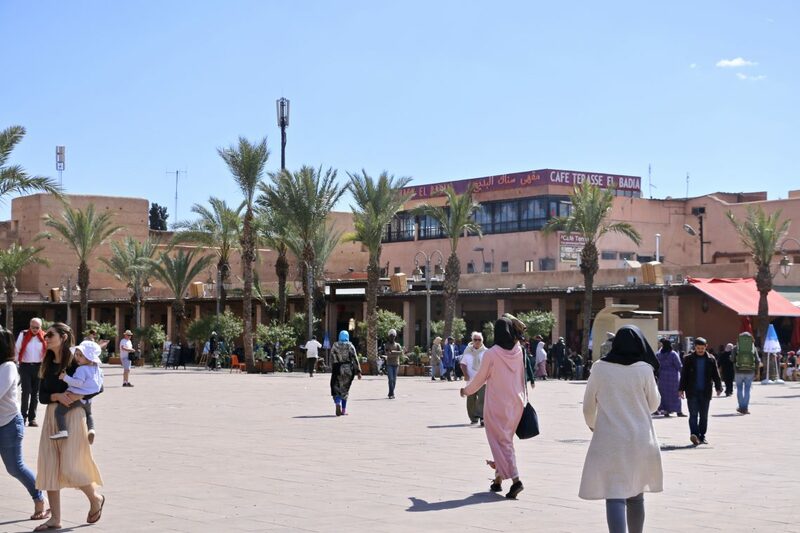 Undoubtedly, the busiest place in Marrakech, Jemaa El Fna is a large public square located in the center of the medina. Occupied by numerous entertainers, fortune tellers, dancers, snake charmers, herbalist and water sellers during the day, at night it turns into a giant outdoor food market where grilled meats, hot couscous, vegetables and traditional Moroccan sweets seduce your tongue and stomach. After exotic African feast swing though the nearby narrow alleys to the famous souks where skillful merchants and hawkers do anything to make you buy their goods. If there was only one thing that you needed to know about Marrakech, remember this. 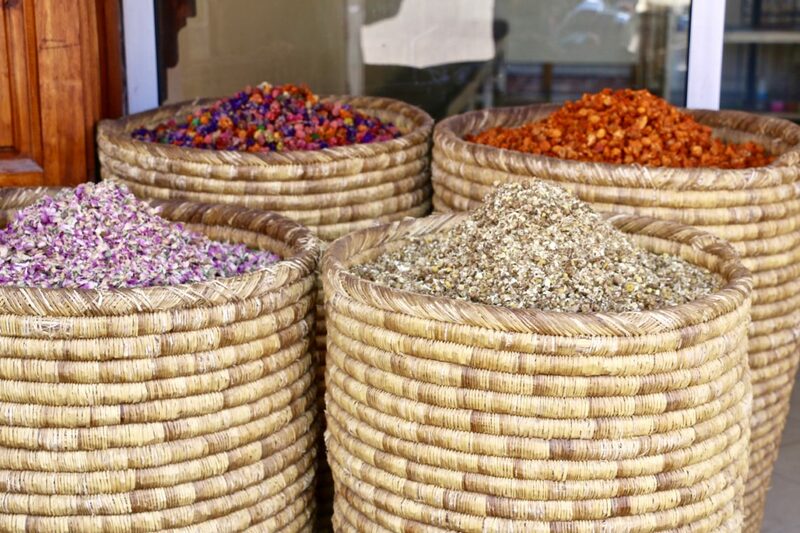 Bargaining is a part of the Moroccan trade culture. Never settle for the original price. Vigorously arguing and praising their products, most vendors will lower the price and masterfully pitch another item while accepting your payment. However, be mindful of your own time and energy and avoid stubborn merchants unwilling to negotiate. You can always buy similar item for your desired price just around the corner. I am sure you figured out by now that this is the place where your empty luggage comes in handy. 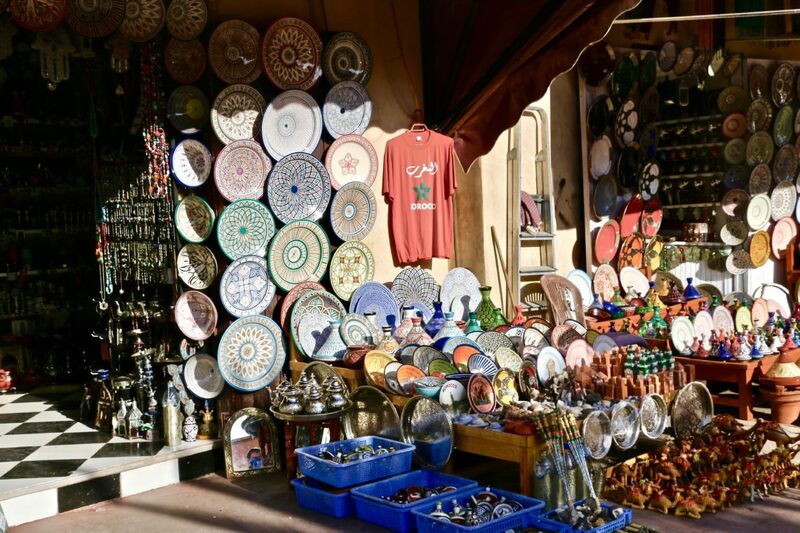 A short walk from the Jemaa El Fna gets you to Marrakech’s most recognizable and prominent site that astounds millions of visitors with its exquisite architecture featuring beautiful arches, curved windows and Marrakech’s world-famous splendid tilework. Like most structures in the city, Koutoubia Mosque was erected in 12th century as a place where devotees could offer prayers. Although the most favored religious edifice, the mosque was the second of the two almost identical structures built at that time. 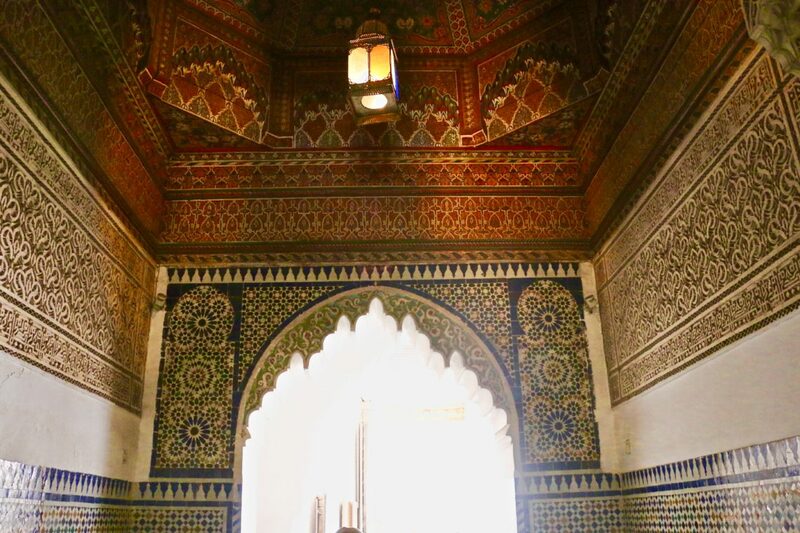 After a series of wars and changes of power from Almoravids to Almohads and later Andalusians, the mosque underwent some reconstructions that reflected religious preferences of the ruling dynasty. 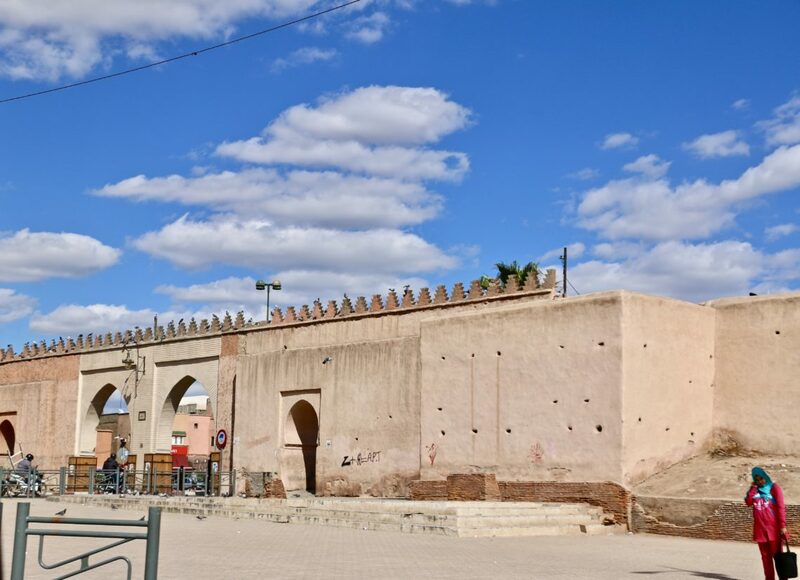 Eventually, two identical mosques differed only in their orientation opened the doors in the southwest part of the medina of Marrakech. With time, the first mosque deteriorated leaving only its slightly younger version with an imposing 253 feet tall minaret rise above all other building in the city. 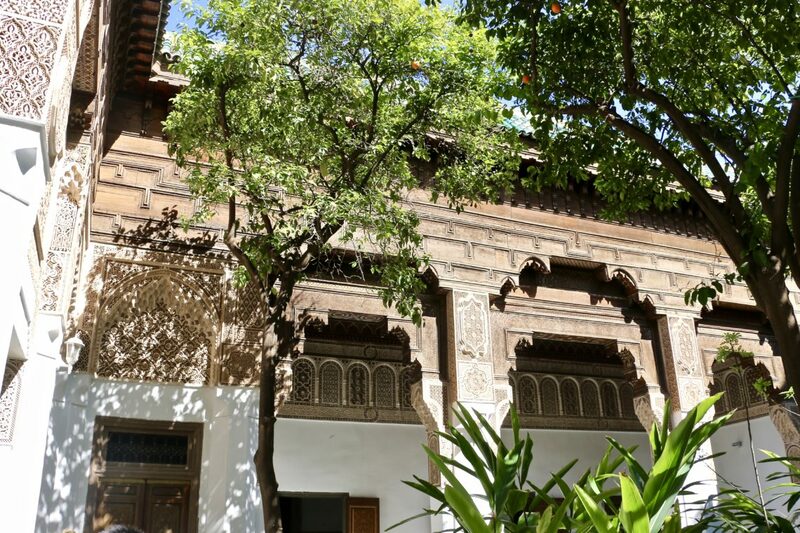 Much younger sibling of all Marrakech’s buildings, Bahia Palace was constructed in the late 19th century in the southeast of the medina. Despite its relatively young age, the palace of Bahia, which literally means palace of the beautiful or palace of the brilliant, has quickly become one of the most cherished monuments in the country. Established as a place of residency of royal family and Moroccan aristocracy, the palace embodies luxurious lifestyle of the more privileged social class. Stained glass windows, rounded entryways, dazzling mosaic tilework, awe-inspiring carvings and paintings on beech and cedar wood along with many verdant, courtyards and gardens reveal the sighs of presence of the royals still from time to time residing in the private, closed for public areas of the palace and provide numerous photo opportunities for its visitors. 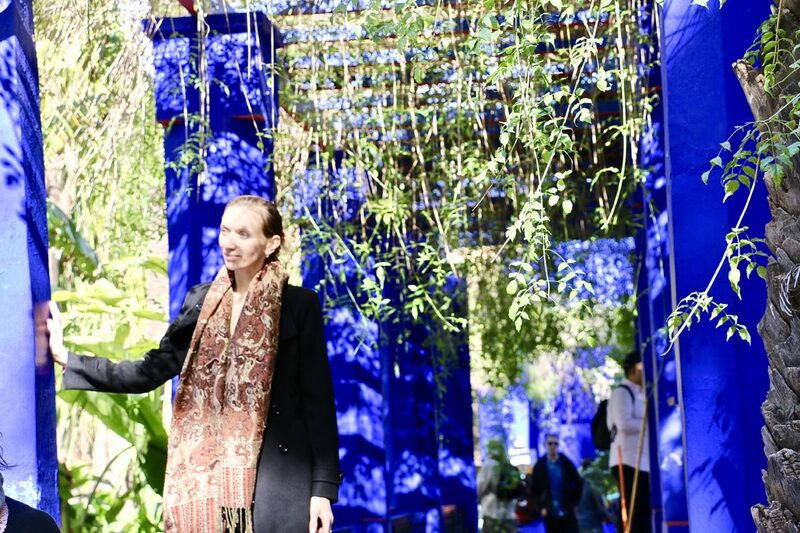 In the middle of the red city, on its northwest side, like a breeze of fresh air Majorelle Garden breaks the traditional color gamut with a bright combination of cobalt blue and tropical green tones. 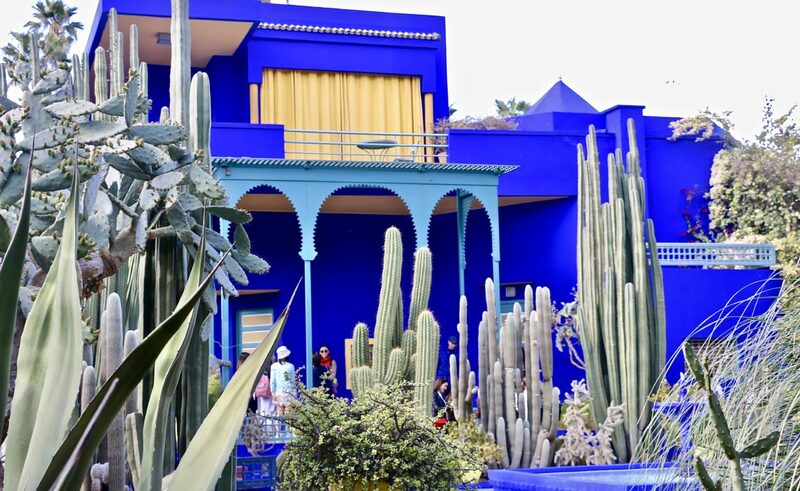 Cobalt blue, one of the dominant colors in the garden, was the favorite shade of French painter Jacques Majorelle who in attempt to cure his heart problems moved to Marrakech where during 40 fruitful years he worked on creating a unique garden that was named after its creator. 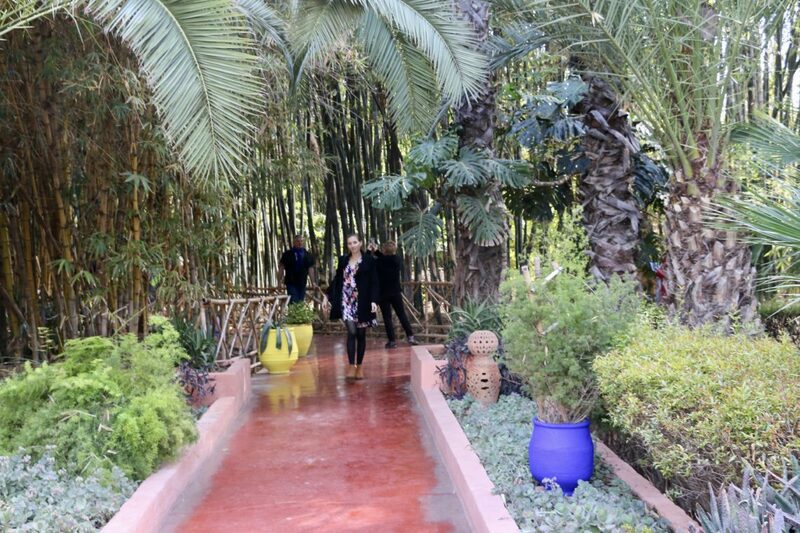 In spite of its magnificent, Majorelle Garden did not received deserved recognition until later when Yves Saint-Laurent bought the property and featured it in the 1997 Chelsea Flower Show in London. 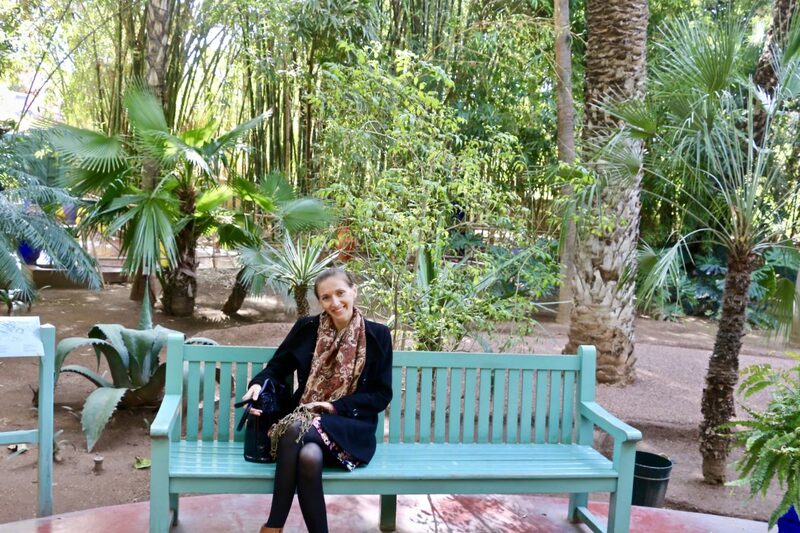 Today the 12 acres garden, home to orange nasturtiums, pink geraniums, colorful bougainvillea, evergreen bamboo, date palms and over 15 different species of birds is one of the most popular attractions in Morocco and might easily surpass Jemaa El Fna in number of tourists. 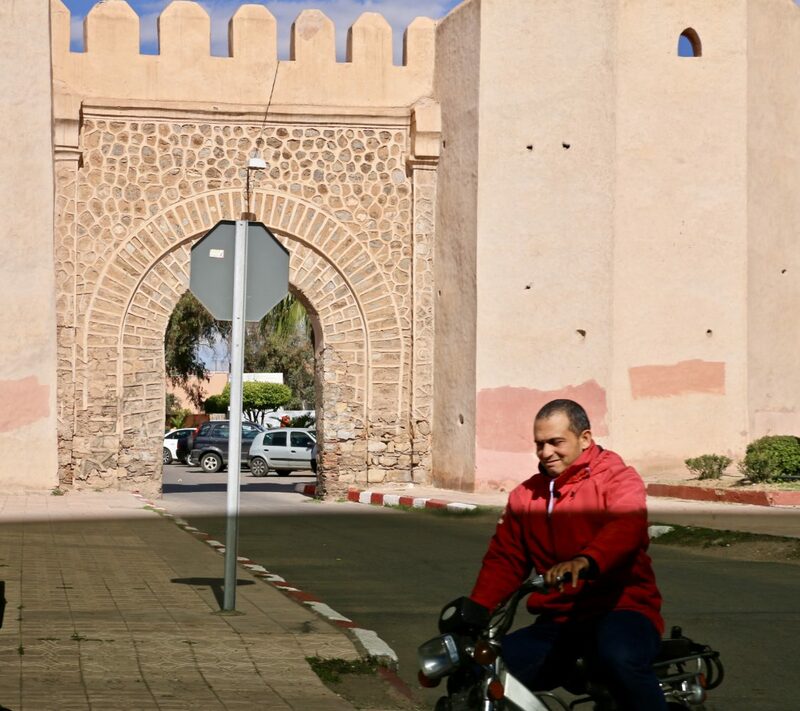 19 feet tall walls with approximately 20 gates and 200 towers extended over 12 miles separate the medina from the new city of Marrakech. For centuries these impregnable ramparts protected the medieval city from attacks of various barber tribes and were usually kept closed at night. 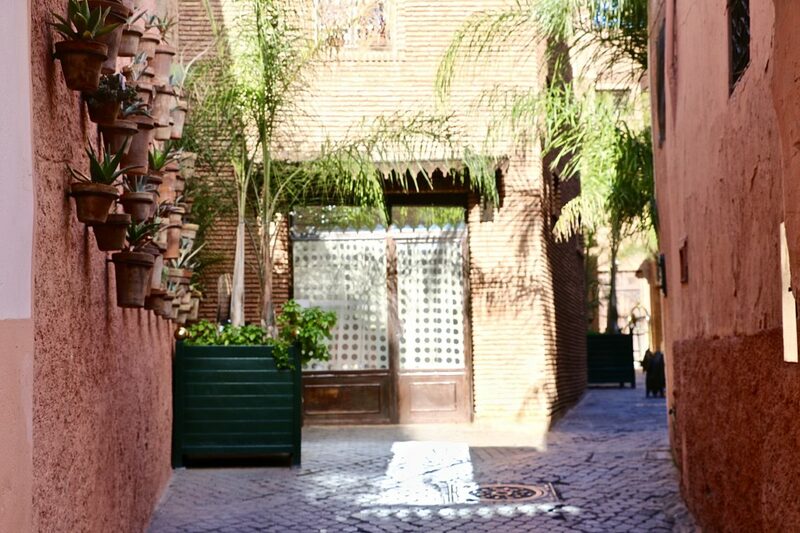 With time the walls ceased their military duties and now serve rather as true witnesses of the long, glorious history of Marrakech. Though strong and indestructible, the red ramparts possess some flaws – small holes on their surface a few feet from the ground that served as a pretext for the birth of many legends and secrets. One of these tales says that the holes were used in constructions of the wall. Unable to reach higher levels, the builders drilled the openings, inserted some small yet strong enough to hold a man logs, stepped on them and continued working. As soon as one level was conquered, a new upper hole appeared giving the workers an opportunity to move further up. This process was carried on until the ramparts were completed. True or not, the residents and guests of Marrakech love these legends and zealously collect and share them with each other. 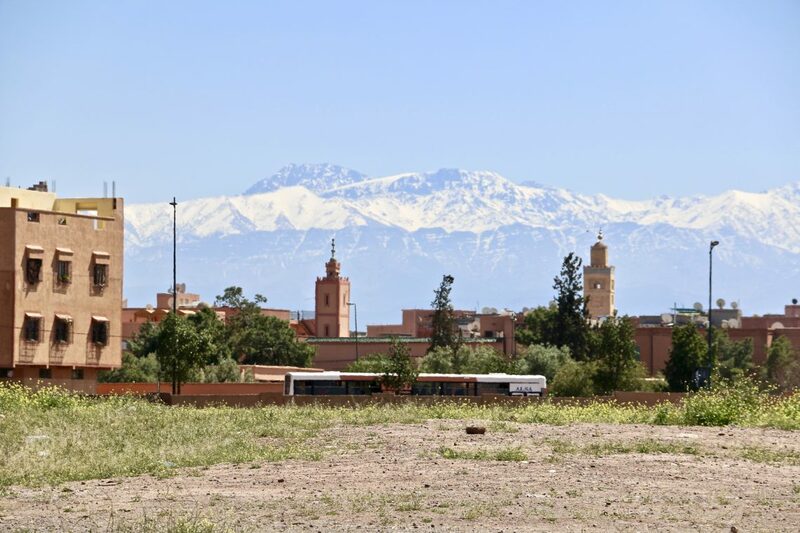 Enticing and overpowering at the same time, Marrakech is very walkable city allowing you to reach most of these 5 must-visit places on foot. To enhance your experience, you might want to get a travel companion who will share with you the pleasure of exploring this Moroccan pearl. And you are all set. Just go there and explore. It cannot be easier than that! Marrakech is my dream destination and your post caused the travel bug to itch me, Zhanna. So many colorful and breathtaking pictures. You must have had an awesome time. 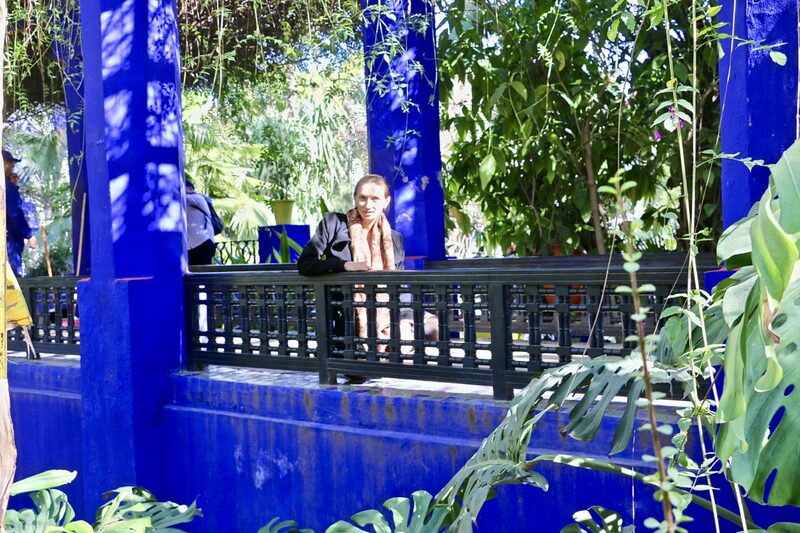 When would it be the best time of the year to explore Marrakech? Thank you very much, Lydia! Seeing this incredible city was beyond any imagination, considering that it was kind of a bonus trip for us 🙂 Wanted to visit it for so long, I was excited and thrilled to finally have the opportunity to explore it. My husband liked to visit a new place, but, growing up in Asian, he have seen similar places before. We went their in March. If you are like us and try to avoid the summer heat, plan your trip in spring or fall. I would love to visit Marrakech someday! It looks like such an amazing place to explore! Thanks for sharing this great guide! My pleasure, Valerie. I hope you will. It’s different and beautiful in its own way. How I have always wanted to visit Marrakech, the places look awesome. May be this year i will. Definitely do it. You will like it even more when you see it yourself.